It was past midnight, around one in the morning. They were in an open field staring through a four meter high barbed wire fence into Hungary, wishing they had arrived only one day earlier -- when the government was letting people through. Mirna Marwan Sheikh Talha was cold. But she was more worried about the women and children in her group of 11. Other than her father -- who left Aleppo, Syria with her seven days ago -- the other people in the group were companions they had picked up along the way. Her two brothers had crossed through Hungary two months earlier and told her to follow their path. But now the way was blocked -- and she did not know what to do. Others in her group were headed to other countries in Western Europe. Talha was a dentist in Syria but wanted to specialize in facial surgery in Germany. It was her passion. "I crossed a thousand kilometers to do this," she said through the fence, to the VOA team standing on the Hungarian side. 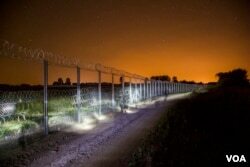 Hungarian police were manning the fence rigorously even at night. Patrols in groups of two were walking up and down with flashlights to check the fence and anyone trying to cross it. Just a short distance away, they had found one sleeping bag flung over the fence and a couple of police cars had arrived at the scene to investigate. Talha did not want to cross illegally. But she and her group also did not want to register in Hungary. They had heard stories that Hungary was denying most of the asylum applications. And they feared they would never be able to cross over to other countries if they registered in Hungary. But for now, they were tired, it was cold and dark, and they needed sustenance. So they decided to spend the night in the open field and walk to the border crossing at Röszke, another 10 or more kilometers, with first light -- in the hope that they would find aid and shelter on the Serbian side for a few days, as they decided their future moves.